On April 5, 1933, President Franklin D. Roosevelt signed an Executive Order requiring that all gold and gold certificates be returned to banks. Forty thousand dollars of the Lindbergh ransom money had been paid in gold certificates. Elmer Irey, ( 1899 - 1948) an agent from the U S Treasury Dept. had to talk Charles Lindbergh into allowing the ransom note serial numbers to be recorded before payment would be made to the supposed kidnappers. Lindbergh had staunchly refused to have this done even though it would not have, in any way, affected the welfare of his child. All gold certificates had to be turned in by May 1, 1933 and anyone who would not do so would face 10 years in jail or a $10,000 fine, or both. Banks in New York City were informed on May 23, 1932, to be on the lookout for the ransom certificates. Three days later, the NJ State Police offered a reward of $25,000 for information that could lead to the arrest of the kidnappers. Later, a pamphlet was given out to every employee handling currency in banks, grocery stores, insurance agencies, gas stations, airports, department stores, and post offices. The pamphlet warned everyone to watch for any ransom certificates and gave the serial numbers of each certificate. Pins were put on an enormous map to symbolize where each ransom bill was found. The authorities pin pointed the kidnappers to the Bronx. On Monday, April 4, 1932, a twenty-dollar ransom bill was deposited in a branch of the East River Savings Bank in Manhattan by a David Marcus who was later cleared by investigators. But, on November 26, Hauptmann's birthday, a cashier named Cecile M. Barr, was working at the Loew's Sheridan Square Theater. She began counting the receipts of the night's business. Then, according to Barr, a folded bill was thrown on the counter. A man in his mid-thirties stood before her. She asked what price ticket he wanted - there were three different prices. The man said "One forty" and Barr gave him a ticket. The next day the assistant manager of the theater took the money to the bank. The bank teller on duty at the Corn Exchange Bank, William Cody, discovered that the bill Barr received by the mysterious man was a ransom bill. Barr was then shown the bill, but this time the folded bill was in the hands of a Lieutenant Finn. Barr described the man as best as she could. He was medium in height and weight. He wore a dark suit and hat. He had blue eyes, high cheekbones, and flat cheeks. His face was triangular and his chin pointed. Her description fit that of Cemetery "John." On September 5, the National Bank of Yorkville turned up another Lindbergh ransom certificate. The bill was deposited by a grocery store. A man from the grocery store said that a male paid for a six-cent purchase with the ten-dollar certificate. He would not have taken the certificate which he knew was to be returned long ago, but business was bad. He described the man as best as possible- the description matched that of John. Yorkville. Another bill was given to Chase National Bank on September 8. The bill was traced back to the Exquisite Shoe Store. The cashier on duty, Albert Shirkes, said that a male purchased a pair of women's black suede shoes for $5.50. A description of the man again pointed to John. Bills began to turn up at a rapid pace. Calls were coming in daily, each claiming another ransom certificate was found. The police were sure of one thing- the person using the bills kept paying for small purchases with big bills. The map continued to fill with pins. The police felt confident an arrest would soon occur. Only $5,100 of the $50,000 was found before the search of Hauptmann's garage. 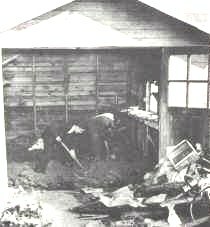 The ransom money found in Hauptmann's garage, $14,600, was the key evidence that got Hauptmann extradited to NJ. The problem in this case is that over $30,000 of the ransom certificates has never been. Excerpt from Charles Lindbergh's letter to the Internal Revenue Service. Hauptmann well understood the importance of this letter as evidence to support his case. A New Jersey State Police report on the secret and illegal surveillance of Hauptmann in his jail cell has the prisoner saying to his wife, �If Isidor Fisch had not died in Germany, I would not be here behind bars. Have you the letter from Fisch�s brother?� Anna Hauptmann responds that the police have taken it. Other documents also support Hauptmann�s contention that he had not known about the ransom money, let alone spent any, until shortly before his arrest. 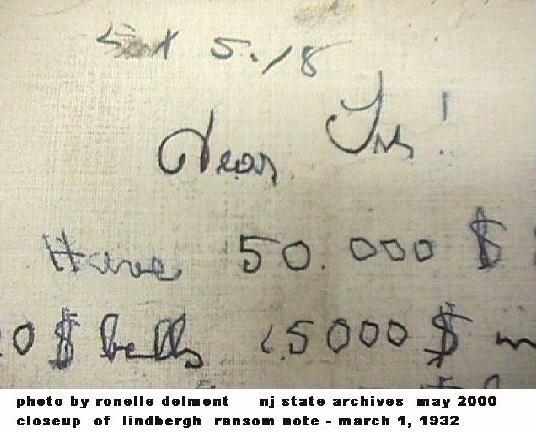 Lindbergh ransom bills discovered between 1932 and the summer of 1934 almost all shared similar characteristics. New York police files contain lab reports of all known ransom money passed in the city, showing that most of those bills bore traces of lipstick and mascara, not to mention microscopic traces of gold or brass particles. Moreover, the bills were folded repeatedly so as to fit into a small watch or vest pocket. The half dozen or so ransom bills known to be passed by Hauptmann bore no resemblance to bills passed earlier. No lipstick traces. No gold or brass particles. No folds of any kind. Furthermore, they all showed evidence of being waterlogged, consistent with his testimony of the saturated shoe box. Perhaps even more interesting, a magazine report published shortly after Hauptmann�s arrest refers to Lindbergh ransom money cashed in by Isidor Fisch to buy his boat ticket to Germany. In its December 31, 1934, issue Time magazine, summarizing evidence that would be brought forward by the prosecution against Hauptmann in his trial, wrote, �Isidor Fisch, Hauptmann�s partner in random business ventures, used ransom money to pay for his passage back to Germany, where Fisch died of tuberculosis in 1933.� Yet this fact was never mentioned by the prosecution during the trial. The reason: police evidently believed at the time that the $2,000 in Lindbergh bills cashed by Fisch was the same $2,000 that Hauptmann had told them he had loaned to Fisch the day he sailed for Germany. The money seemed to constitute important evidence against Hauptmann. Only later was it discovered that Fisch had cashed the ransom money several hours before Hauptmann withdrew $2,000 from his bank account to give to his friend. The implication is clear: Hauptmann had been telling the truth, and it was Fisch, not Hauptmann, who had the ransom money in 1933. In addition, and also in regard to the claims that Hauptmann had the "Fisch money" (or ransom money) all along, as opposed to sometime in August, as per his "Fisch story," there's the rather obvious (and uncontroverted) fact that right about the time he claims to have found the Fisch money, he goes on a bit of a spending spree. He passes how many of these bills in how short a period of time? Buys some shoes for his wife, if I recall correctly. And does it right out in the open. Even gets into a dispute with a grocer who doesn't want to accept a large bill (was it a $10?) for a small purchase, and then wins the dispute and forces the guy to accept the bill. When Lyle, the gas jockey, notices the gold note and comments about it, Hauptmann doesn't make an excuse and take it back (it was evidence, after all), but chats the guy up about how he's only got about a hundred or so left at home. And lets the guy keep the bill. Which results in his arrest. The same thing could have happened with the grocer, and you KNOW that guy was going to remember Hauptmann. Which he did. Point being, Hauptmann's bill passing is entirely consistent with his Fisch story and entirely inconsistent with the state's theory. If the guy had the money all along, why would he suddenly go on a "spending spree" in August and September? I mean, he had the money all along, right? And why pass it so openly if he knows it's Lindbergh ransom money? It doesn't make any sense. Unless you argue that Hauptmann was intending to get caught and use his sudden spending spree as a set-up excuse to support the Fisch story. Yea, that makes a lot of sense. I know Hauptmann said and did some crazy things after he was arrested and framed to take the fall. But that was all AFTER he was arrested and framed. Personally, I think the guy just lost it and pretty much gave up hope after he saw what was happening to him. He had to know he couldn't stop it and the handwriting was on the wall. You can't fight city hall, right? In the first was found one hundred ten-dollar gold certificate wrapped in a September 6, 1934 copy of the Daily Mirror; the second contained eighty three ten dollar gold certificates in a copy of the Daily News dated June 25, 1934.
from "Crime of the Century: The Lindbergh Case"